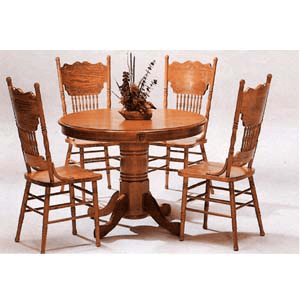 5-Pc Solid Oak Round Dinette Set. Solid Oak Veneer Top Dining Table With Empire Design Table Base 5245(CO), Size: 42 In.Dia., 29 In.(H).. Solid Oak Double Press Back Size Chair 5275A(CO), Size: 16-1/2 In. (L)., 20-3/4 In. (W)., 42 In.(H).. Strong Construction. Easy To Assemble.